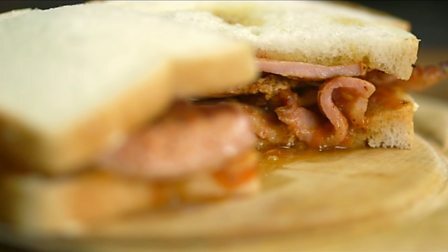 James Martin shares his grandma’s secret to the perfect bacon butty. Put the bacon into a cold frying pan, then turn the heat up and cook for a couple of minutes before adding a knob of the butter and the quartered tomatoes. Cook until the bacon is just golden-brown at the edges and cooked through and the tomatoes are softened – about 5-6 minutes. Slather the bread with the softened butter and place the tomatoes onto one slice of the bread and press down slightly, then add the bacon and top with the second slice of bread. Press down lightly to squish it all together then cut in half and eat, mopping up any spilled butter and juices with the sandwich as you go.